People are using Apple’s AirDrop feature to send gross, explicit photos to strangers, unsolicited. Luckily, there’s an easy way to prevent it by going into your iPhone’s settings. 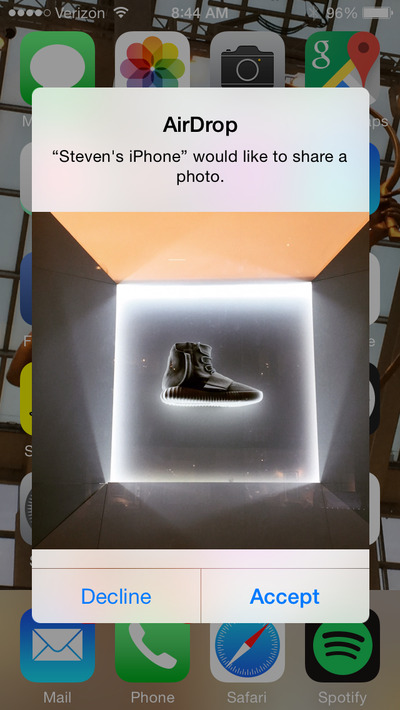 People have found a new way to send gross, unwelcome photos to strangers – Apple’s AirDrop feature. The AirDrop feature is incredibly useful in letting Apple users quickly transfer photos and files between iPhones, iPads, and Macs, as long as Wi-Fi and Bluetooth are both turned on and the devices are close to each other. But as Wall Street Journal reporter Joanna Stern experienced Friday morning, people have figured out they can use AirDrop to be a bit more …. creative. In order to be sent content over AirDrop, your iPhone or Mac has to be set as “discoverable” to other iOS users. You can choose to set AirDrop as available either to “contacts only” or to “everyone,” which can make it easier to share photos with someone whose number isn’t in your phone. By default, it’s on “contacts only,” but it’s not common for iPhone users to turn it to “everyone” at some point, and forget to switch it back. At some point after AirDrop’s 2011 release, however, Apple users realised – whether by accident or not – that they could send whatever they wanted to any nearby iOS or Mac OS device that has relaxed AirDrop settings. Some people have taken the opportunity to engage in some old-fashioned trolling, while others have used the feature to flirt with strangers. Nathan McAlone/Business InsiderAirDrop is designed to be an easy way to send files between Apple devices. But as we tend to do, humanity had to find a way to ruin a good thing. Incidents of “cyber-flashing” started to come to light in 2015, with women from New York to London reporting they were being sent explicit photos of male genitalia. Sure, you can “decline” an AirDropped photo to stop it from being saved to your phone, but the notification that pops up on your screen when you get an AirDrop is big enough that a picture of someone’s anatomy would be unmistakable. To avoid receiving unsolicited photos, it’s worth checking your AirDrop settings now to safeguard your iOS device. Under the “General” tab in your iPhone’s Settings app, “AirDrop” is near the top. From there, you can choose between making your Apple device discoverable to “Everyone” or to “Contacts only,” or even turn receiving off completely. 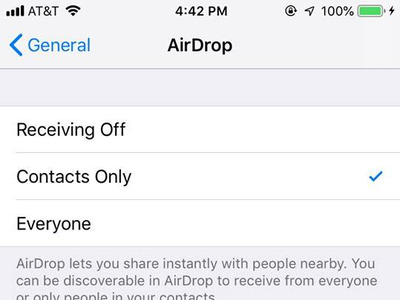 It’s worth noting that if you’ve never used AirDrop before, your phone is probably already set to “contacts only,” which is Apple’s default setting.